We are curators for the Maryland State Park System and are doing preservation work on the house that we live in. For those of you who live in Maryland, our house is part of your state park system. Over the last several weeks we removed the plaster from the log walls in the kitchen on the first floor, insulated between the logs and started getting it ready to chink between the logs. 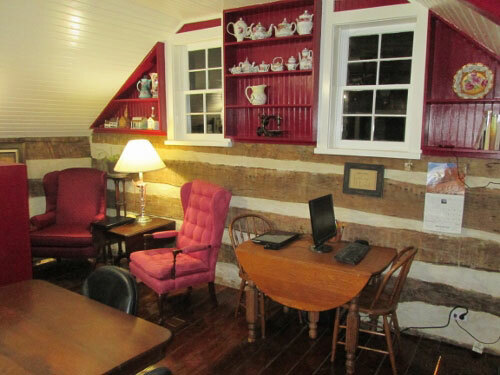 It appears from evidence that we saw in the demolition process that the log cabin could possibly date back to the 1700’s. We found several names scratched into a section of log chinking and four sets of initials carved into a board on the staircase. 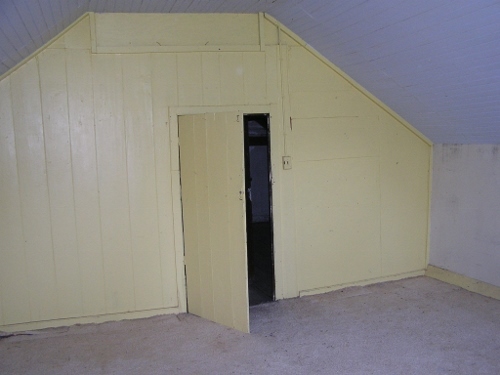 The main part of the house was built around 1900. Below are the before and after pictures of one of the upstairs rooms of the log cabin section of the house that we finished up this past month. 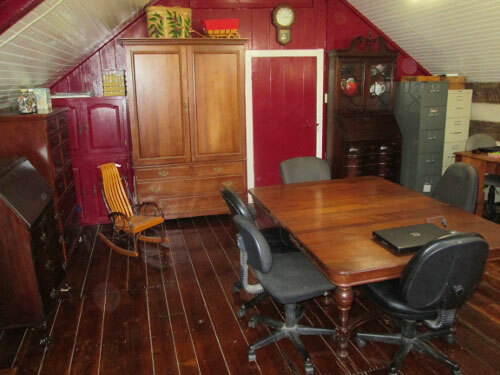 For being part of the upstairs of a log cabin it is a large room measuring 17′ x 18′. We used this room for our homeschool school room for the last eight years. Since we have only two children left in school, we decided to make it into a library and a cozy place to read and do internet research in the evenings. 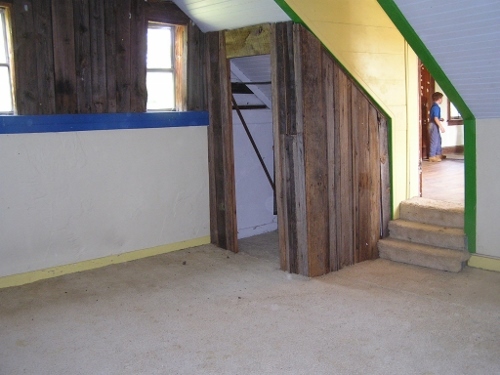 Hidden behind the plaster in the previous picture were beautiful hand-hewn log walls. We removed the old chinking between the logs and added insulation before rechinking. The windows were replaced and the floor refinished. You have heard of how God provided this farm for us and why we gave the farm its name. God’s provision has not stopped there and has continued in the years since. The last several months have been like Christmas as we bought furnishings for this room and bought antique cabinets for the kitchen. Each time as we went to an auction, we would pray that God would provide what we needed at a good price and to keep us from buying things that we didn’t need. It was amazing how the prayers were answered over and over. The rose colored Queen Anne chair on the right in excellent condition – $2 These two wingback chairs provide a neat cozy corner for reading. The red cabinets in the corner were purchased cheap a number of years ago and painted to match the wall. The large cherry sewing cabinet to the left of the door was custom made by Myron as a wedding gift for Cathy. The small bentwood rocker was Cathy’s when she was growing up. The antique Walnut extension table in the center of the room – $80 The legs were designed in such a way that we could cut off several inches off of the legs and lower the table to make it easy to use with laptops. As I write this, the girls are using it for crafts. 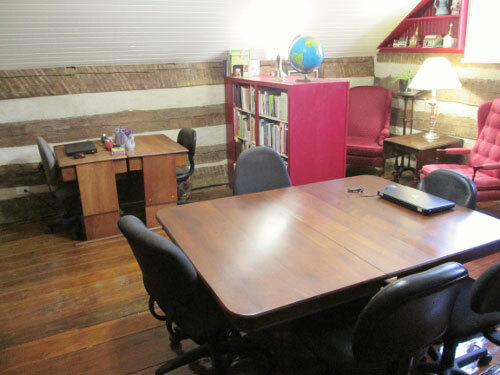 The two cherry desks along the wall Myron made one for each of the children for school. The legs are adjustable to grow with the child. The double sided red bookcase creates a nice room divider for the cozy corner. It was free from a job when Myron worked in construction. We repainted it to match the room.